My husband and I were at CNN online looking for info on the fires burning around Orange and Riverside Counties (where we live) and we noticed the “Strange News” tab. Naturally, I clicked on it and immediately saw this story about a crow named Canuck. 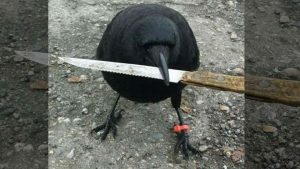 Canuck is a Canadian crow and quite an accomplished thief according to the man who raised him. Canuck stole a knife from a crime scene. How cute! I thought you might enjoy it. Why am I talking about a crow? Because Saturn (and Rahu) rule crows and because they are so intelligent, curious, and funny birds. Feeding the crows is a great Saturn and/or Rahu remedy (both Saturn and Rahu rule nature and wild animals). If you want to know more about that, just follow the link below to the article I wrote about my experiences with feeding the crows on Saturdays. If you would like to get remedies for your planets, including gemstone recommendations for your health, get the Whole Life consultation. My recommendations are the Vedic remedies of mantras, gemstones, and feeding the crows, but I also suggest books, coaches, therapists, courses, writing and other activities including how to use the Planetary Hours to intensify the remedy. Hi Karen, I have an interesting story for you regarding the Crow, Raven, Magpie and Blackbird (s), All Birds. It’s not “a story”. I have had many mystical happenings with these birds mentioned, even come to think of it a Black Butterfly even……. So when I went to Sourh India to the Saturn Temple with this concern n confusion, I was next to a co-worker (of the Family we worked for, doing a Spiritual trip to India), mentioning this again, she also knew some Vedic astrology about my very odd Saturn thing, as we both were in conversation, a Crow flew right by us, perching on top of the Iron Temple Diety Statue of Saturn (I think Sani) with a Crow carving, now with the Live Crow on top! The co-worker, said, ‘I don’t think you have a problem with Saturn….look! I remembered when I stayed behind to wash my feet at the Temple entrance, the Crow was there’, flying forward to the Temple from my right side. So, it was definitely something. I didn’t know, I don’t assume about whether he was my friend or not. However, a lot of mystical happenings has occurred with those Birds I mentioned, and other mystical, eso and exo phenomenon/s. I had Interaction recently with. A Great big Raven, with a very shinny Black coat, Huge Long beak, you can handsome in appearance. In Burbank, CA, a few months ago. Magpie in London, someone gave me a feather of (but I returned it eventually, because I was upset with who it possible that represented). In Monts France, Crow’s and/or Black-Birds a group of them ‘sprayed’ me, in their flight towards my bedroom window me looking out. I pick up fallen bird feathers every given Moment! Ooops*, in the India trip 1993. We also got to go to the Inner Sanctum of Surya~Sun. We also attended a private Major Rahu puja, with the Long Horn at the Rahu Temple, I have no idea if it was evil or not. I Only take the Good out of the situation anyway. Blackbirds also remind me of Children and Scotland too. Do you think it’s a bad O’man? Not everything that is happening around you is an omen, good or bad. It depends on whether or not you are thinking about something specific and looking for omens that seeing a crow could be good or bad. Thank you for sharing your interesting story!